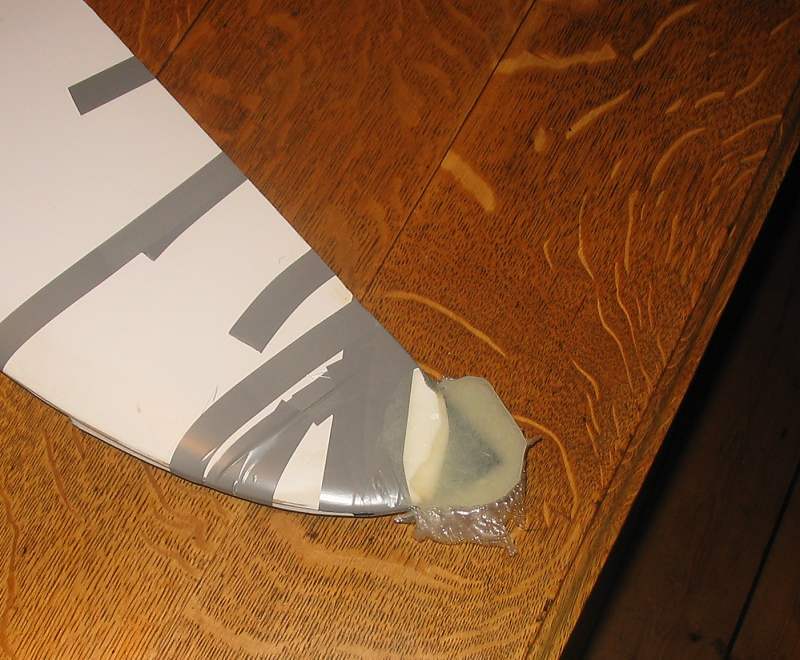 This Fireball rudder took a bad knock to the tip. Here is how to repair it. Somebody tried to repair the tip with with cheapshit David's P-40 fibreglass mix. It didn't work. 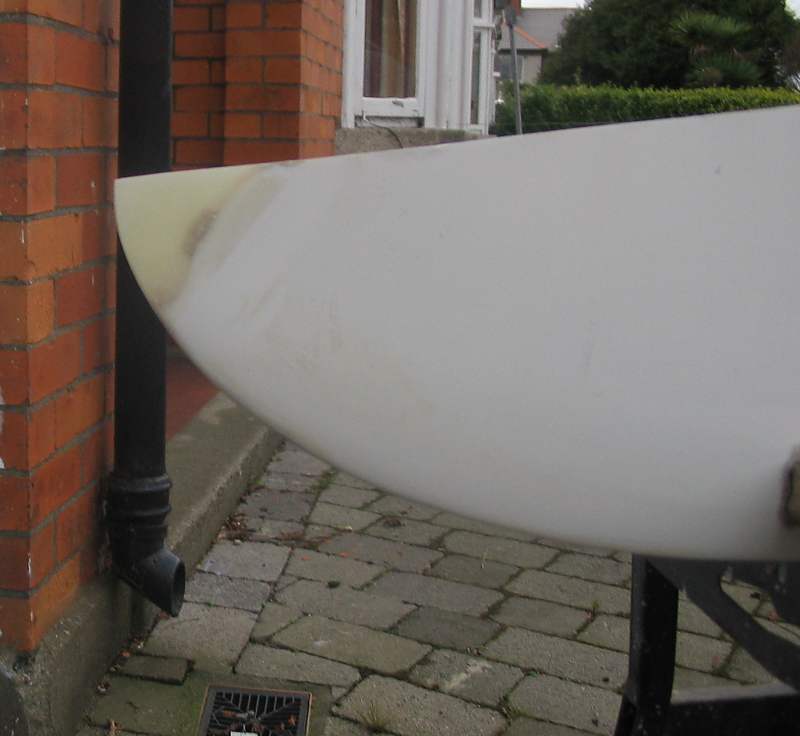 The shape and size of a One Design Fireball dinghy rudder is very specific. 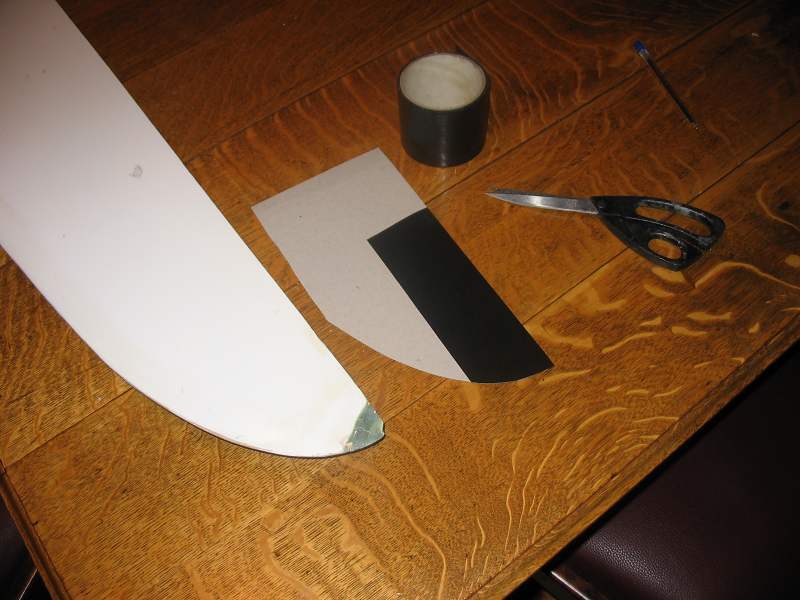 I made a template from another class legal rudder using cardboard covered with farmer's silage tape. Epoxy resin will not stick to the tape. 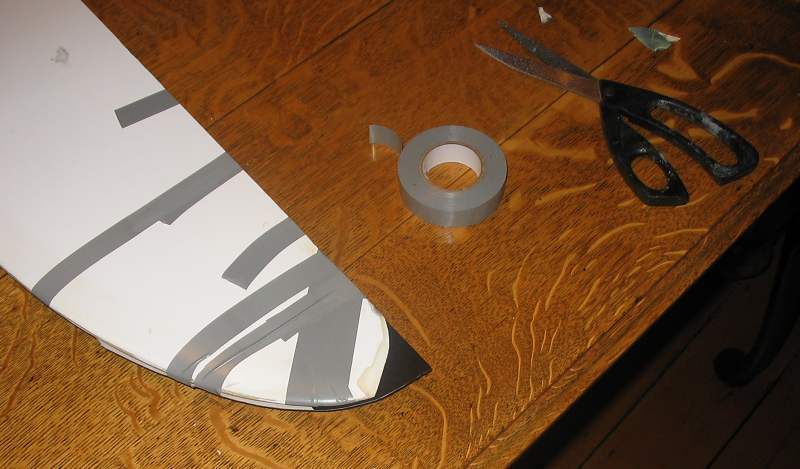 You can use electrical tape, laying strips side by side. Yes, that is the dining room table. The rotten piece has been cut away. 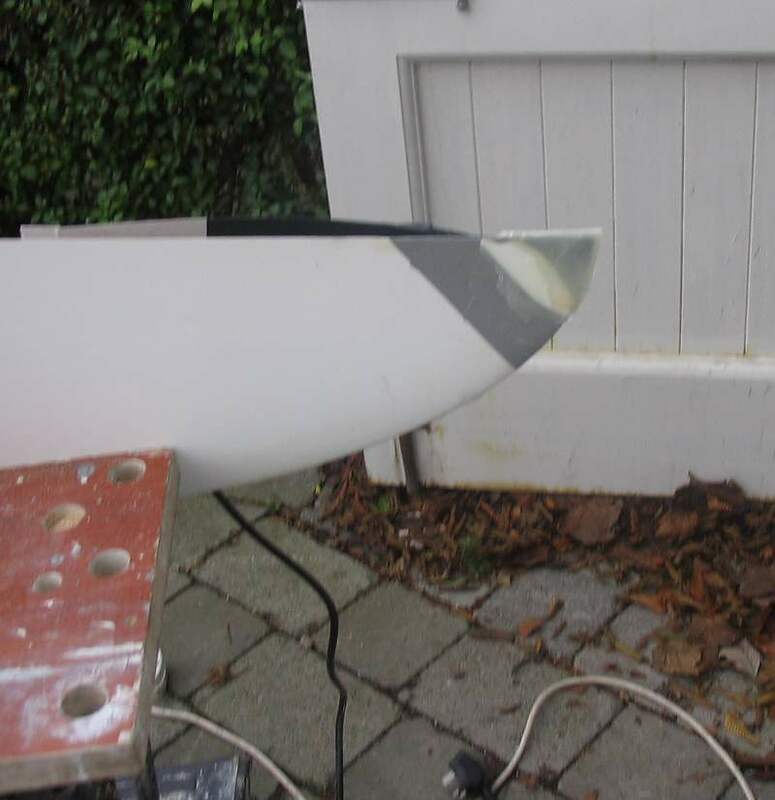 Next step is to carefully grind / chamfer the rudder bottom to prepare for re-construction with epoxy resin. The bottom of the rudder has been chamfered, using sandpaper on a block, to provide an area of adhesion. The cardboard and tape template has been locked in place with lots of electrical tape. The repair needs to be strong and stiff. I'll make a mix of WEST epoxy resin, some colloidal silica as thickener, and chopped bits of fibreglass to provide strength. Epoxy resin and filler, alone, is too brittle. The pieces of glass fibre provide the strength. I use scissors to cut bits of chopped strand mat into individual pieces 3 - 6 mm in length. 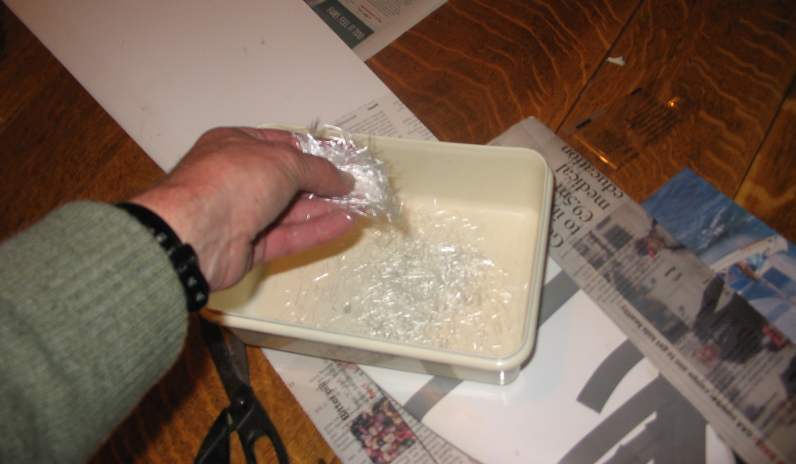 The epoxy resin has been mixed in a cleaned yoghurt container. Mixing stick swiped from the local coffee shop. 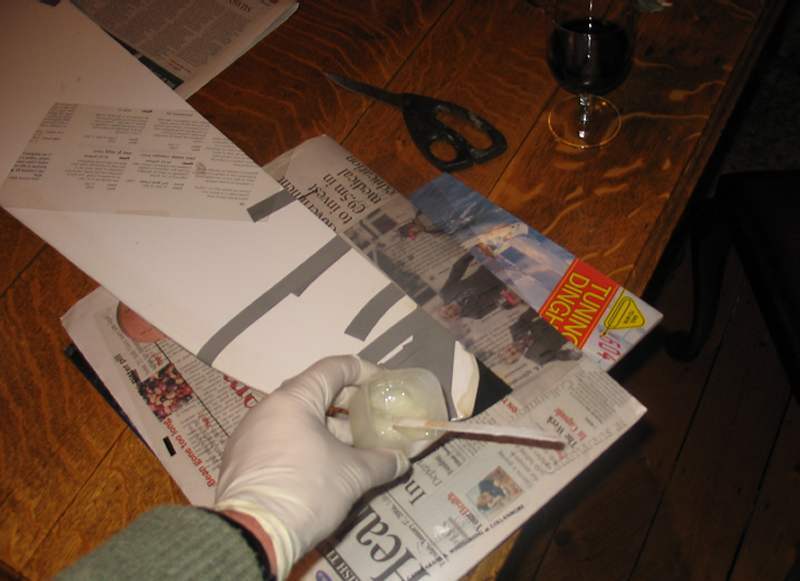 Beneath the rudder is a sheet of acetate and a bit of newspaper to protect the dining room table from any overflow. The book serves to balance the underside of the rudder. The glass of wine (Australian cab sauv) is standard operating procedure. 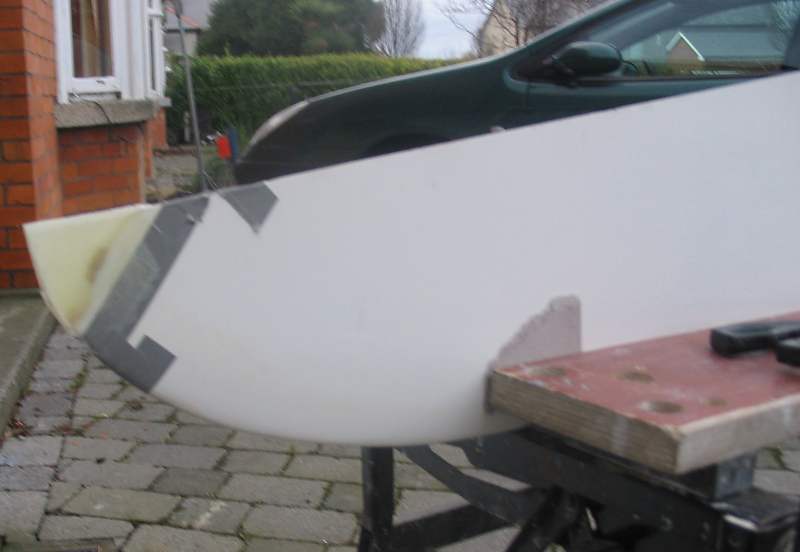 The epoxy resin - filler - glass fibre strand mix has been poured and coaxed into the end of the rudder. 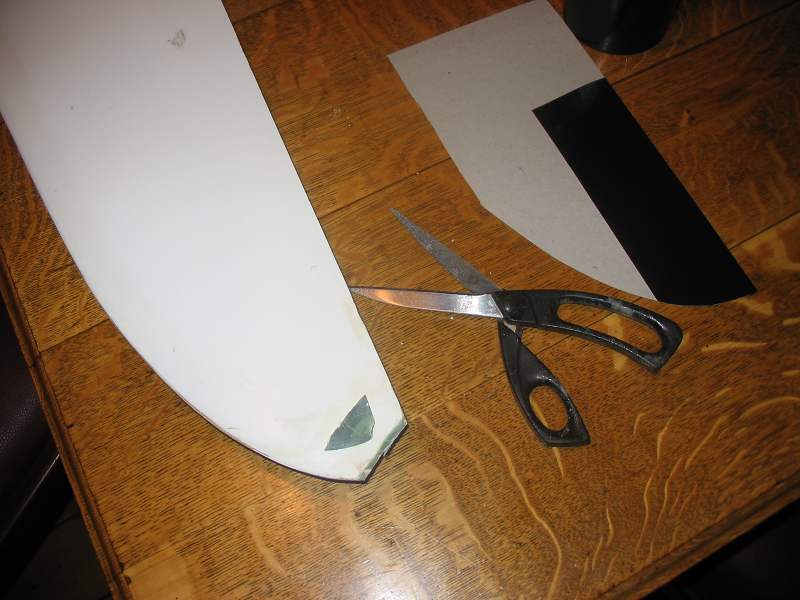 A piece of acetate has been placed on top and gently poked and prodded into shape. There is a good bit of excess which will be cut away later. 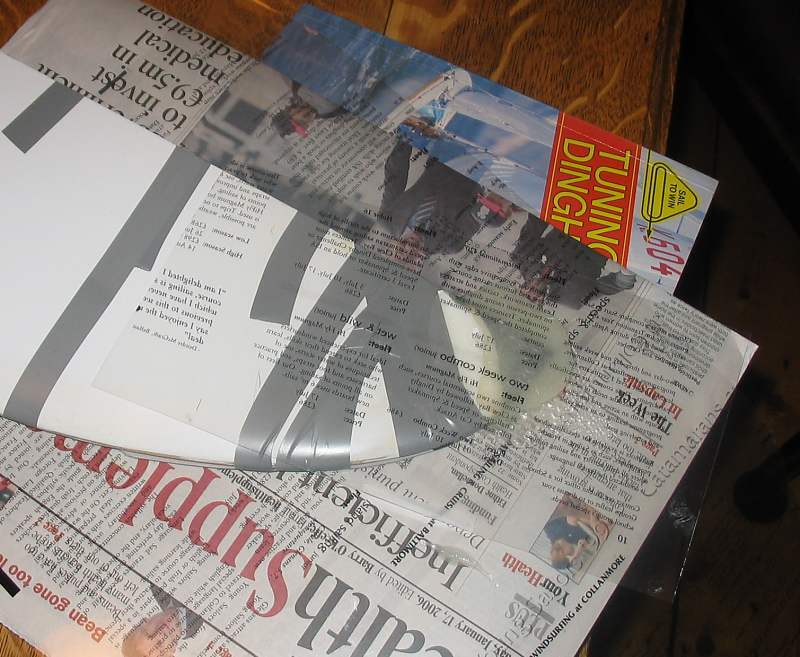 I get the acetate from a friend who runs a print shop, the sheets are part of the printing process, discarded after use. Overhead projector film will work just as well. I'll leave it to cure overnight. More wine is called for. After cure, and with the acetate and newspaper stripped away, here is the result. You can see that the cardboard and silage tape template is still in place beneath the repair. Outside, and locked in the workbench, I used a Dremel grinder to get rid of the overflow of cured epoxy resin. Here the cardboard and silage tape template has been removed, sorry for fuzzy foto. The repair has been rough sanded and shaped using wet and dry sandpaper on a block. The final stage is to spray paint with high-build polyurethane paint on each side, let dry and then wet sand with 1200 grit paper for a perfect finish. Sorry not to have a photo of finished invisible mend, batts ran out on the camera and the client need the foil for racing. Total repair time: 5 hours over three days.